According to 2010 Labor Department data, there are too many college graduates in the work force without college-level jobs to sustain them. In the workforce, there are roughly 41.7 million people with college diplomas, either associate, bachlors, masters, or doctorate-level. 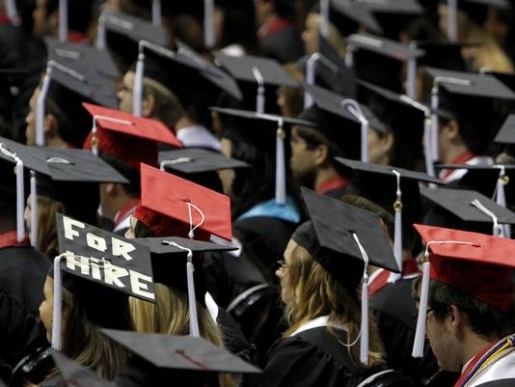 There are only 28.6 million jobs that require college degrees. That means nearly half of all American workers are overqualified for their jobs, and that number’s only going to get worse, says Richard Vedder of the Center for College Affordability and Productivity. Indeed, a variety of jobs are now being staffed by college graduates that require nothing of college experience. Over 115,000 janitor positions, 5% of the total in the country, are now staffed by college graduates. One out of every four sales clerks, 25%, is a college graduate. Even 15% of cab drivers are toting around useless college degrees, and that number is only going to increase. So, prepare for the new reality in which everyone from garbage collector to stripper is toting around a Masters degree in Victorian literature.